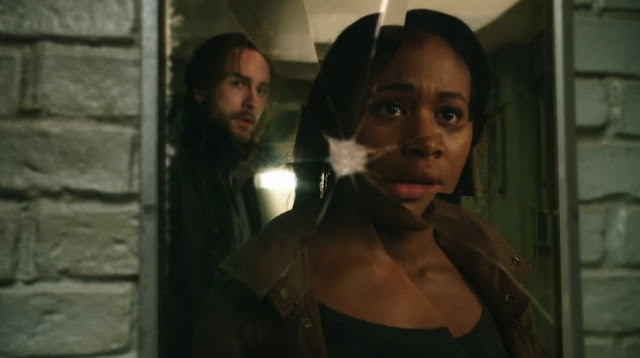 OTIS (Odd Things I've Seen): Sleepy Hollow’d Out or Sleepy Hollow-lujah? Sleepy Hollow’d Out or Sleepy Hollow-lujah? September 18, 2013 — Monday evening, FOX premiered its show Sleepy Hollow, where Washington Irving’s Headless Horseman tale gets updated with cops and commercial breaks. Now, you guys know me. I’m enthralled by both the Washington Irving story and the Hudson Valley region where it’s set. Because of that, I wasn’t sure if I was going to be extremely tough on this show or extremely lenient. But I did know that I wasn’t going to miss its premiere. Admittedly, the show does have a lot going against it. FOX already burned me this year with The Following, which took an absolutely diabolical angle on the modern-day influence of Edgar Allan Poe (to their credit) and then scuttled it with terrible writing in just about every way. Of course, just the fact that Sleepy Hollow is on a major network is a strike against it. We’re in a golden age of television programming these days, but the best TV is just not happening on the major networks. They’re still hampered by having to chase the lowest common denominator for the widest possible audience. Still, shove a flaming jack-o-lantern onto a stunt guy’s shoulders at this time of year, and it’ll go a long way to turning me into a Nielson number. In this new version of the story, Ichabod Crane is an Oxford professor-turned-Revolutionary War soldier. But this Brit’s on our side, because he has all the modern sensibilities toward freedom and equal rights that major networks think he must have to be a sympathetic character. 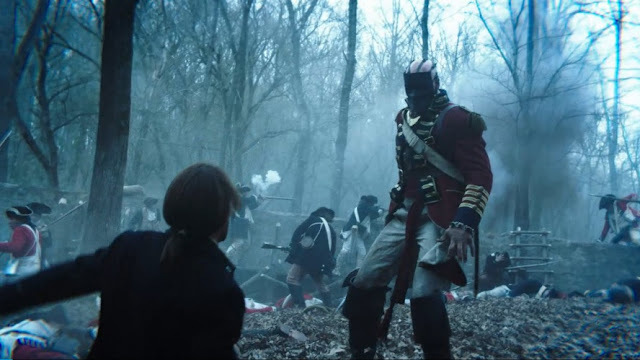 In the first few seconds, Ichabod kills a mysterious masked being in the middle of a battle by chopping off its head, becoming mortally wounded in the process and then Rip Van Winkle-ing 250 year later into modern day Sleepy Hollow, complete with the wonders of automatic car windows and the fact that the general he served under is on its currency. But, it turns out, so has the headless fiend that he dispatched, who rides around on a white horse with glowing red eyes (but no pumpkin on his shoulders) looking for his noggin. Over the course of the show, we find out that the history of the United States is not one of war with tyranny and oppression, but a story of supernatural warfare. The founding fathers didn’t just jumpstart a country, they delayed an apocalypse. And the headless one is only a harbinger of terrible, Biblical things to come. He has friends in this version of the story. So basically, the premiere seems to be promising a monster-of-the-week type show, where the headless horseman is a member of the infamous Four Horsemen of the Apocalypse (“Death” is what it says on the back of his motorcycle jacket), and they bring with them all kinds of demony creatures that must be dealt with before the end times end. And only Ichabod Crane and his police officer partner can do it. So it’s not so much a horror show like The Following. It’s more in the vein of Buffy or The X-Files or Supernatural…a monster mash leading up to a big world-changing (or ending) event. With jokes. I’m not too averse to that idea. Mostly, what struck me about the pilot was that it was fast…and not fast like BBC’s Sherlock Holmes or anything Aaron Sorkin develops. Like the plot moves as if the People Who Cancel Shows are one of the Four Horsemen. Nobody’s in the dark for very long in this show. There’s no time for mystery, for subtlety, If a backstory is hinted at, it’s laid out minutes later. If a character is introduced, he’s killed minutes later. There’ s no time for getting used to a new century or the fact that a guy has no head or that everything in the book of Revelations is just a few seasons away. Ichabod, this is Starbucks. Got it? Good. You’re up to speed. Headless Horseman, this is an automatic rifle. Got it? Good. You’re up to speed too. The rest of you: Monsters are real, priests can throw chains with their minds, and there are covens of witches in Sleepy Hollow. Now may the best anachronism win. 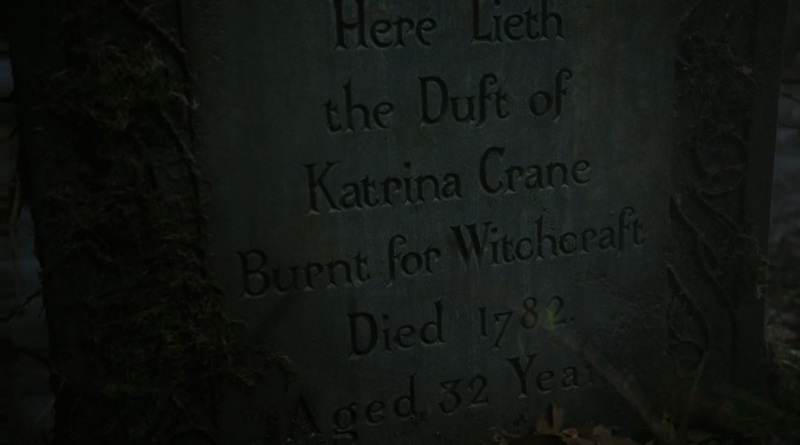 For me, a big make-or-break for this show is how they portray the town of Sleepy Hollow itself. Not sure how the locals feel, but I think I’m reasonably satisfied. First, it’s filmed in North Carolina, so it avoids all the Los Angeles/New York visual clichés that abound in TV Land. And it was relatively atmospheric. The fast pace meant you weren’t in any one environment for very long, but still. And even though, in my mind, Sleepy Hollow is in a perpetual autumn, the stark, leafless trees worked, I think. 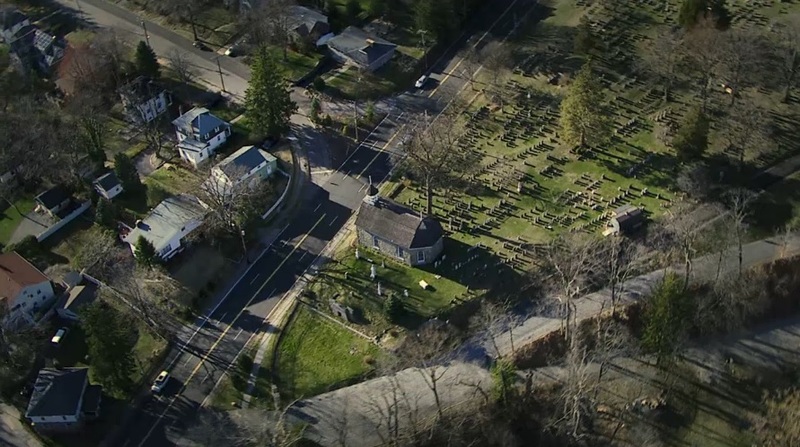 Most interestingly, it even seemed to insert overhead shots of the actual Sleepy Hollow in New York…or maybe they were CGI. I don’t know what’s more expensive these days, a helicopter or rendering software. Looks real to me, though. where the Headless Horseman is supposed to rise, behind which is the grave of Washington Irving himself. The original bridge is long gone. Today, a street bridge crosses the creek, just below the bottom of the frame. 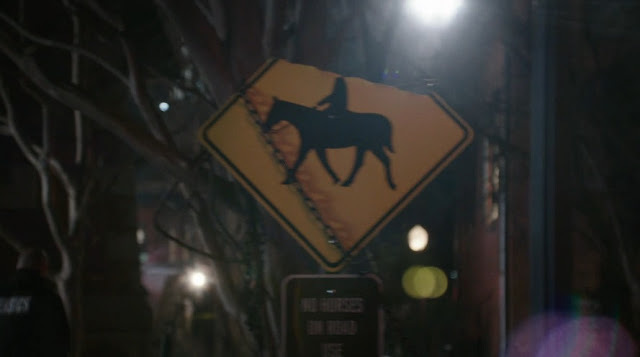 The only sad thing about the town of Sleepy Hollow portrayed in the show as compared to the real thing is that, in a world where the Headless Horseman is real and not a story, you can’t theme a town around it like. I mean, you can’t have a police officer shooting at the thing that’s on the side of his car, you know? Or is the mascot for his kid’s basketball team. Or is a statue in the middle of town. Actually, I'm not sure what the rules are on that, but it seems weird. So, the big question: Is it good? I can’t believe you’re going to ask me that after Sunday’s episode of Breaking Bad set new bars for what’s good on television. But I can’t say that. 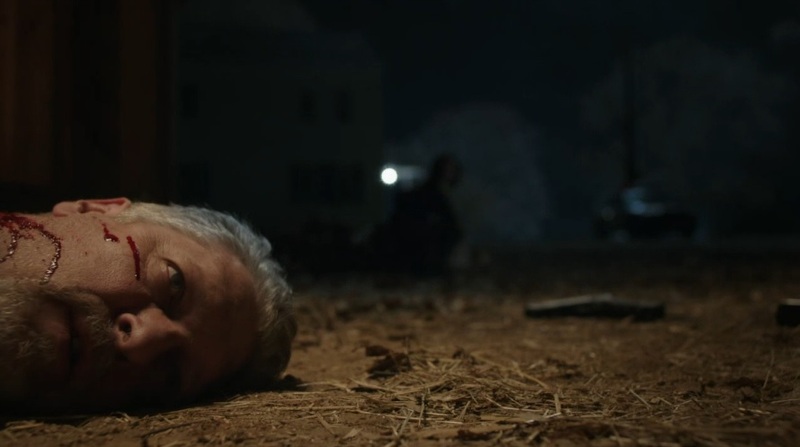 But I can say that, at this stage, with one episode under its belt, the show seems sincere and, more importantly, knows what it is: an over-the-top spook show cavorting about in a well-tread territory. As for me, subjectively, all I really ask of a show at this time of year is to give me something to watch that enhances my Autumn experiences, whether that’s making caramel apples or gutting pumpkins. And I think Sleepy Hollow can do that. Whether it’s just so much candy corn or enough to sustain me in the long term, who knows? It does have this going for it: There are only two more episodes of Breaking Bad left. But having to wait a week between episodes is so 2011. They beheaded the Kurgan. Maybe they know what they're doing.